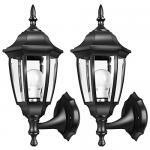 ★ OUTDOOR SOLAR LIGHTING: Perfect accent lighting for a patio, deck, fence, or other outdoor area. 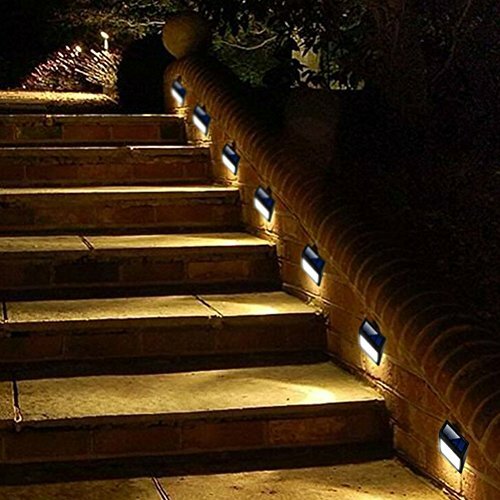 ★ EASY TO INSTALL: Outdoor solar lantern attaches easily to outdoor wall, step, fence post, or deck rail. 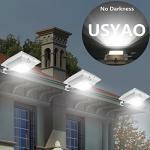 ★ NO WIRES: Solar-powered, rechargeable battery provides up to 8 hours of outdoor solar light. ★ DEPENDABLE: Turns on automatically when it gets dark outside. 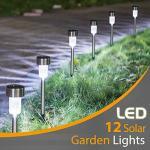 Enjoy LED Solar Light dusk to dawn. ★ SAFETY AND QUALITY GUARANTEED - Comply with CE and ROHS Certification; life time up to 10000 hours. This outdoor solar lamp charges itself in the daytime and light up automatically at night. It is designed for people who like environmental friendly solar energy, and now more smart people enjoy using it to decorate their homes and gardens. 5. Get charged only when switched to “ON”. 6. Please put the light under the standard sunlight 6 to 8 hours before using it. Because this is a kind of solar light, the illumination time depends on weather conditions, if the weather clear, it will last lighting about 4-6 hours, if the weather gloomy,illumination time will be shorter. Turn on a switch on the back of this product, and put it on the place that has plenty of sunlight. It will be in charge automatically when it’s in the daytime and in the sunshine. If so, the light will work automatically at night and you don’t need to take any other action.